A short video clip of Bernard Katz with his glass blowing team blocking and papering a hot gather of glass. This is the final gather of glass for a custom glass sculpture. The video clip was taken during one very hot humid day in August. Wet wooden blocks and wet folded newspaper is used to shape hot gathers of glass while blowing glass. The hot glass is actually riding on a thin layer of steam between either the wet wooden block or wet newspaper. The blow pipe has to be constantly turning when riding on this layer of steam. If the blow pipe stops turning while in contact with the wooden block or paper, the hot glass will stick to the block or paper. When hot glass sticks to a block or paper flaws and unwanted marks may be created. 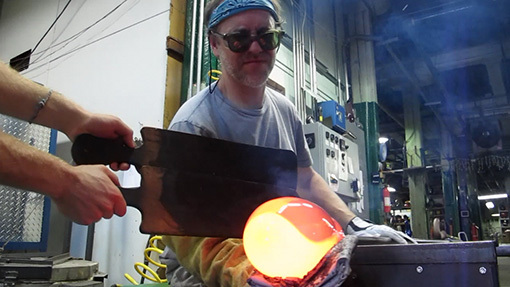 When reversing the turning blow pipe in another direction, Bernard ever so slightly pulls the block or wet paper away from the hot glass gather. This prevents the glass from sticking, and creating a unwanted mark. Because the glass is very hot, you can see Bernard’ s assistant shielding his arm from the heat with wooden paddles. A small glimpse into the day in a life at Bernard Katz Glass studio making art glass sculpture. A four part video series on this day of glass blowing while making a custom glass sculpture.